You've read, in my last couple of postings, about the land grab in the Negev by the Bedouin, and the fact that former minister Bennie Begin, who had promoted the Prawer Plan, now sought to secure its withdrawal for lack of support within the Knesset. That plan - which prompted rioting by some Bedouin because they wanted even more than they were scheduled to receive - is not yet law. It had passed only one reading of three required, and Begin recommended to the prime minister that it be dropped. Miri Regev (Likud), who heads the Knesset’s Internal Affairs Committee, however, announced that there would be further discussions on the plan. 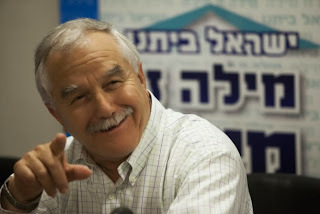 Now the news is that Agriculture Minister Yair Shamir (Yisrael Beitenu) is likely to take over the job of shepherding the plan through the Knesset and implementing it if it becomes law. Shamir is a no-nonsense nationalist, concerned with Jewish rights. On Sunday, in Monaco, a meeting was held of the World Policy Conference. Attending were Prince Turki Al-Faisal (shown below), former head of the Saudi secret services and at one time Saudi ambassador to the United States, as well as Israeli officials MK Meir Sheetrit (Hatnua) and Itamar Rabinovich, former Israeli ambassador to the US. 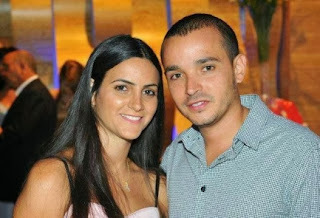 According to reports, Al-Faisal publicly shook hands with Rabinovich and spoke openly with Sheetrit. In a normal world, this would not be news. But in our world, it is. What we're seeing is the hint of a thawing of the Saudi attitude towards Israel. It does not mean we are about to have full and warm relations with Saudi Arabia any moment now, but it certainly signals something of a shared concern about Iran and Obama's policies. My take is that this was spontaneous behavior on the part of the prince. Of course, since the "hint of thawing" is mostly behind the scenes, the Saudi government found it necessary to declare subsequently that it has no relations or contacts with Israel. 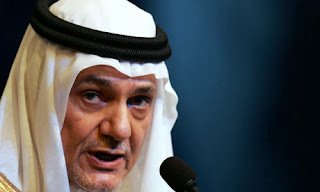 Reportedly, Sheetrit invited Al-Faisal to address the Knesset, but the prince declined until such time as Israel accepted the Saudi "Peace Initiative." Yesterday, Master Sgt. Shlomi Cohen, while traveling in his vehicle near Rosh Hanikra, 50 meters from the Lebanese border, was killed by gunfire - some six or seven shots - from across that border. The gunfire, which severely wounded him, ultimately proved fatal. IDF soldiers returned fire, apparently wounding two Lebanese. Cohen, 31, of Afula, was a career soldier. He leaves behind a wife and 11 month old daughter. There is little thought that Cohen was killed by Hezbollah (this does not have the mark of an Hezbollah operation). Rather, the assessment - apparently based on what was seen from look-out points - is that he was shot by a member of the Lebanese army who acted alone and without provocation. Protest has been registered with UNIFIL, and Defense Minister Ya'alon has declared that the Lebanese government and the army are responsible. But given present circumstances, there are no plans for a major response. There is no information on what will happen to that lone sniper (I would assume that nothing will happen) or what motivated him. The Voice of Lebanon radio station, which identified the soldier as Hassan Ibrahim, reported that he had fled his post following the incident, but returned to his base on Monday morning. And then, to the subject that refuses to go away: the "peace process." Kerry was here briefly during the storm. 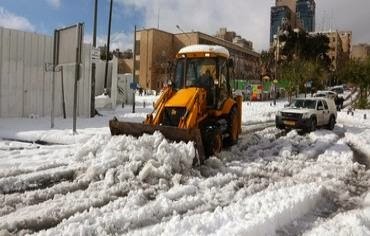 He did meet with Netanyahu, and, for a short while before fleeing the weather, with Abbas in Ramallah. At a press conference at Ben Gurion Airport on Friday, Kerry declared that a full and final peace agreement is still possible within the nine months allocated for negotiations. Talks are now at about half-way mark. “Our goal remains as it always has been — for the Israelis and Palestinians to reach a final status agreement...The core framework, if you want to call it that, which we are discussing with respect to this, centers on the critical issues: Borders, security, refugees, Jerusalem, mutual recognition and an end to conflict and to all claims." In spite of recent Obama suggestions to the contrary, Kerry insists that the US is aiming only for a full agreement, not an interim arrangement. "We're not talking at this point about any shifts (in the schedule). The "shifts" refer to suggestions that had been made that the release of the next batch of terrorists from Israeli prison would be held up. This was offered as a reassurance to the PLO: 26 more are supposed to be released on December 29. Ouch. "We remain hopeful that we can achieve that final status agreement. Why? Because we are absolutely confident ... that for both sides, and the region at large, peace can bring enormous benefits." But wait a second here. Privately, both sides insist that nothing of substance has been accomplished during the negotiations. What is more, not only has Abbas rejected the Kerry plan for Israeli security in the Jordan Valley, he reportedly gave Kerry a letter last week that outlined "Palestinian Red Lines," which include "refusal to recognize Israel as a Jewish state." While Netanyahu has made it clear, repeatedly, that recognition of Israel as a Jewish state is a necessary and bottom-line requirement for peace. 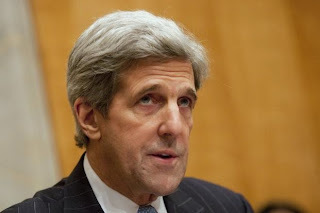 ...not even John Kerry can truly believe that there is the possibility of a final agreement in four months. And so, if we exclude the possibility that he's smoking something (I believe Naftali Bennett suggested this), then we have to ask where he's coming from. The Obama administration has had a string of diplomatic failures. At one point it was plausible to think that perhaps Obama and Kerry were banking on an Israeli-PA agreement to promote as a stunning success. But there will be no stunning success. Rather, they run the risk of having to tuck their tails between their legs and run for it. A smart maneuver, if there were any sincerity, would be an announcement that said Obama and Kerry had given it their all, and are proud of having done so. But, if the parties don't want it, they cannot make it happen. But this is not what Kerry is doing. There was a time when it was also plausible to hypothesize that Obama was extorting Netanyahu with regard to Iran: cave on the PA negotiations and I'll be tough on Iran. But since the Geneva interim agreement, he's lost that bargaining chip. And so? What are they up to? Why are they playing it as they are? Caroline Glick says that Kerry is forcing "Israel's moment of decision." The Secretary of State, she says, is planning to bring his own "peace plan" here next month, and intends to push Israel into making concessions up front, before the Palestinian Arabs have agreed to an end of conflict and a final deal. Thus, she says, Netanyahu must stop trying to wait out Obama and instead extricate Israel from that "two-state trap." That Kerry is lethal and not stupid is a conclusion that it's difficult to avoid making. Notice that before leaving Israel, Kerry said that "both parties are committed to fulfilling their obligations to stay at the table." This, itself, is a form of pressure, of course. And, quite frankly, knowing how Netanyahu functions, I find it difficult to believe that he'll walk away (as much as I wish he might). He tries to "play the game," whenever and however possible. As Glick put it, by "giving the bare minimum of revocable concession possible to keep Obama at bay." But does a reluctance on Netanyahu's part to walk away from the table - and have the PA label him as the one who was the stumbling block to peace - necessarily mean that our prime minister will concede all that Kerry now seeks? I see a resilience in Netanyahu and in our nation that would preclude what Kerry is setting out to accomplish. Keep in mind that even if Netanyahu were determined to grant all that Kerry sought, it would not be in his power to do so. For example: eastern Jerusalem is a part of the sovereign state of Israel and cannot be relinquished without a referendum. What is more, an attempt on Netanyahu's part to surrender Judea and Samaria would unquestionably bring his government down. This does not mean - not for a second - that I make light of Kerry's intentions! It is situations such as the one I describe here that have convinced the Levy Report Campaign Committee that we need that Report - with its declaration of Israel's legal rights in Judea and Samaria - now as never before. Now is not a time for reticence on this score. There is an enemy in the White House, and it behooves all who care about Israel to be on guard and to fight with full determination for Israel's rights and integrity. "The negotiations are not meant to bring an end to the Israeli-Palestinian clash; all they are intended to achieve is Israel's withdrawal from the West Bank, while leaving the conflict to fester." Technorati Tag: Israel and Saudi Arabia and John Kerry and Peace Talks.